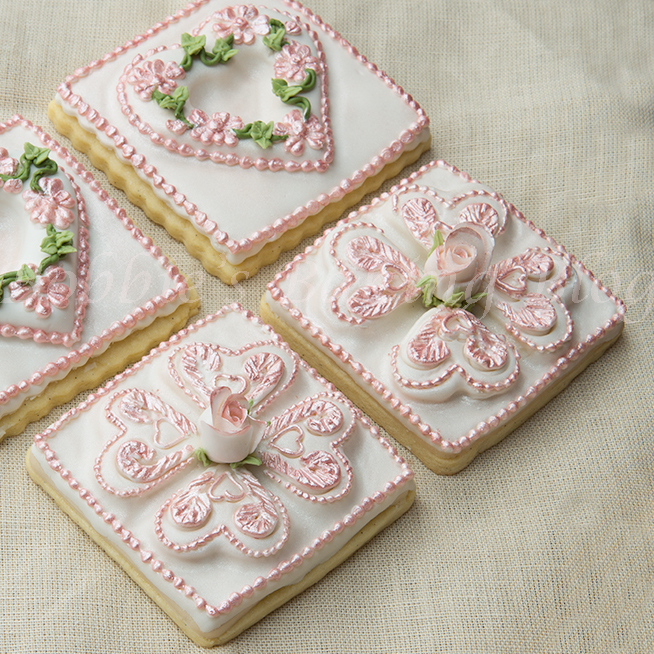 An eloquent wedding favor or bridal shower cookie! 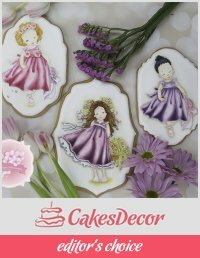 You know you have achieved cake/cookie decorating mania when you see a comforter online and it inspires you to recreate the effect on a cookie (this technique could be constructed on a cake as well). I was extremely pleased how eloquent the final result looked. My first thought was how nice they would be for Valentine’s Day, however they are detailed, fragile and time consuming. 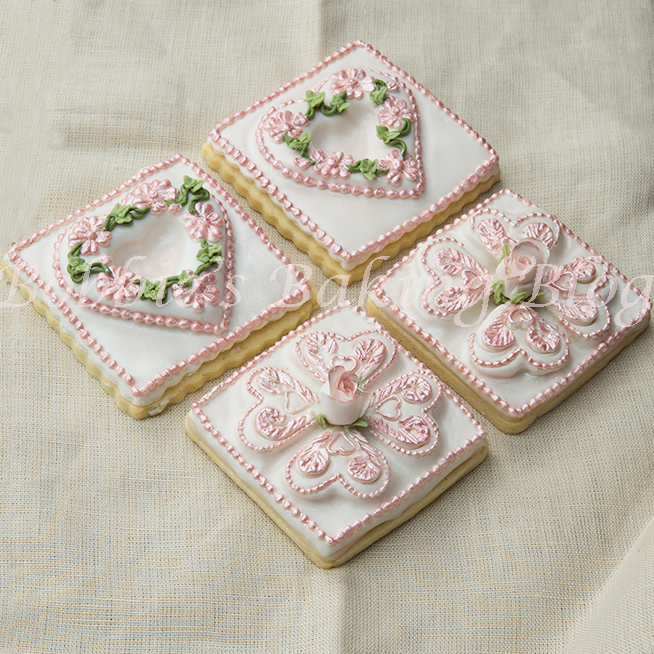 The tufted heart cookie would be better suited for a wedding favor or a bridal shower. I literally have had over 10 wedding inquiries. If you plan to sell a similar design remember to price accordingly. You will need to take in account your time, materials, ingredients, overhead, delivery, and set-up. I love the billow tufted effect! Bake, cool your sugar cookies completely and prepare your mise en place. 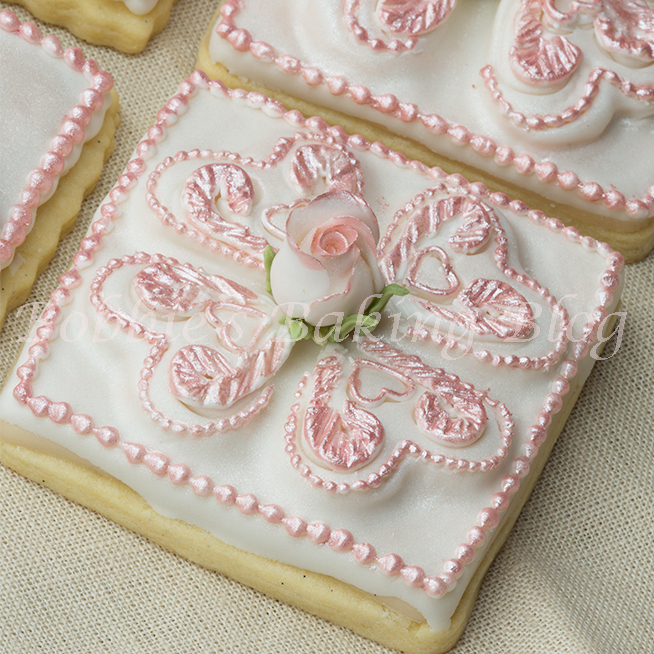 You will need an off-peak consistency royal icing and soft/medium consistency royal icing. 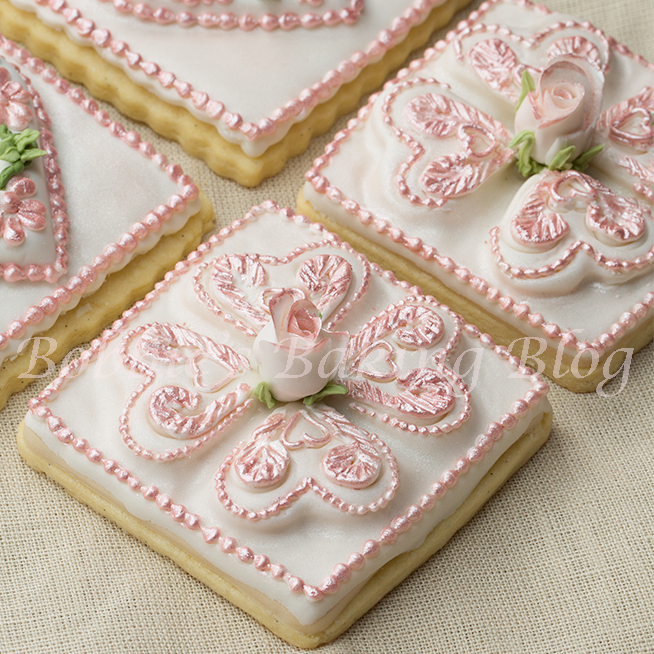 They not only look beautiful, but the tufted heart cookie tastes delicious! I find filling the piping bag with royal icing the size of my palm, meaning the portion of the bag of royal icing in no larger than the palm of my hand. Fill your piping bag to the size of your palm, this will ensure you don not injure your hand with too much icing. Fill your piping bag/cornet, fitted with the #3 writer nozzle/tip, with the off-peak consistency. Fill your piping bag, fitted with # 1.5 writer nozzle/tip, with the soft-medium peak consistency. 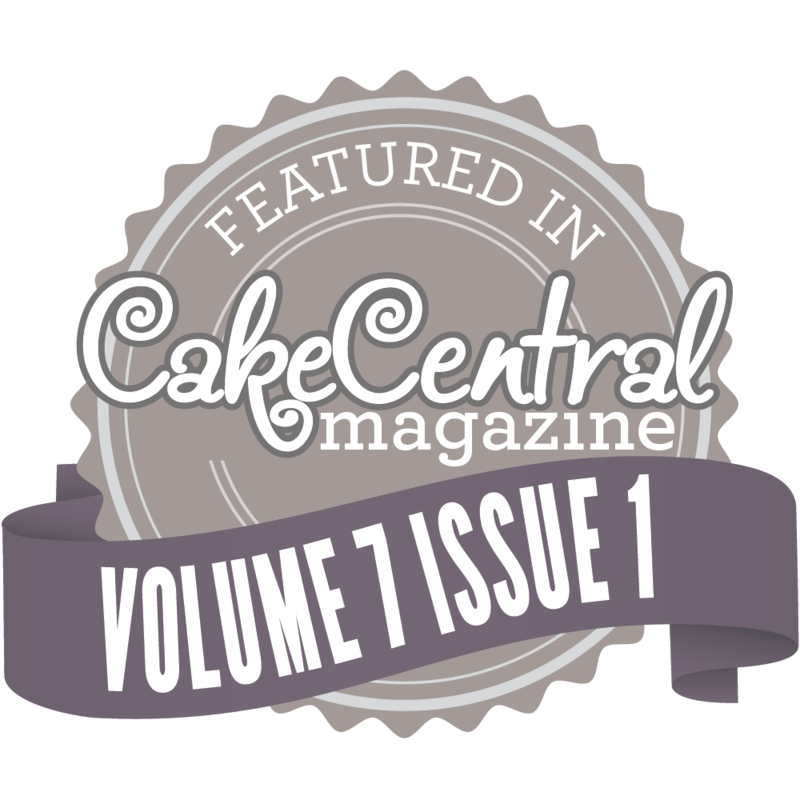 Fill your piping bag, fitted with the small leaf tip, with the off-peak consistency. For leaf colour piped calyx mix 1/2 toothpick of vine green and 1/2 toothpick of moss green food paste. Do not completely mix the colour to achieve a variation coloured calyx. 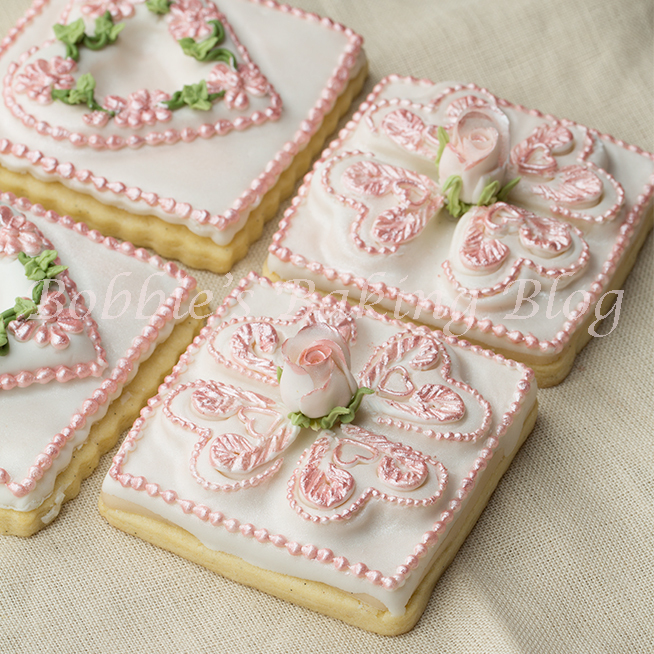 For the tutorial on the construction of the Tufted Heart Cookie. The primrose heart tutorial will be coming soon! the how to make sugar rose that is in the middle of this cookie. If you have question please leave a message. 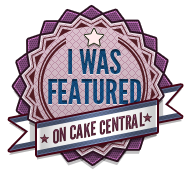 Have a sneak peak of my new video Primrose Garden Tufted Heart (the cookie in back right hand corner)! So beautiful!! Amazing work..thanks for sharing. I am impressed, what a great idea for tufting!! thank you, Wendle..glad you enjoyed the video! Thank you, I would love to post your work on my Facebook page! What an amazing idea, I love both videos! I absolutely love this cookie!